The giant African land snail is considered one of the most invasive pests in the world, and is believed responsible for carrying a parasite (in its slime, no less) that is responsible for a form of meningitis that is harmful to humans. There doesn't seem to be much appeal to keeping this animal as a pet, and it's illegal to do so in the United States. These huge snails are relentless omnivores, and have been known to chew through plaster walls (theoretically because they contain trace amounts of calcium, which snails need for shell health). Fortunately, they're not carnivores. They are, however, extremely resilient, which is why efforts to eradicate them has been difficult. Despite their voracious appetites, many people in the U.K. and Asia keep these snails as pets, describing the snails as having cute faces and expressive eyes. Giant African land snails are hermaphrodites, meaning they possess both the female and male reproductive organs. Two snails are still needed for breeding, but they are very prolific breeders. A fulica can reportedly lay 1,200 viable eggs per year, with several hundred eggs in a single clutch. If you are keeping giant African land snails, you must be extremely careful about disposing of the numerous eggs produced. 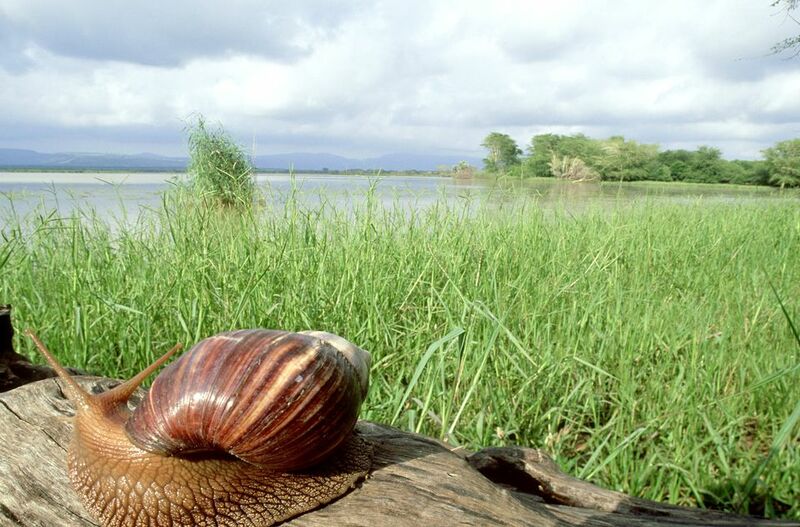 Infestations of giant African land snails can be a significant threat to indigenous plant life just about anywhere the animals live. A good sized, well-ventilated plastic or glass tank with a secure lid is required for this species. For just a few full-grown snails, you would need a 5- to 10-gallon tank. Pieces of wood, cork bark or clay flower pots provide an interesting landscape and hiding spots for the snails. The substrate will need to be cleaned out weekly. Mist the tank daily to keep the substrate slightly damp (not wet, however). Snails need constant moisture in order to prevent dehydration and shell problems. Although they come from a tropical climate, giant African land snails seem to adapt well to lower temperatures. The tank temperature would need to be between 70 and 77 degrees Fahrenheit, so you would have to use heat strips, which will require you to pay closer attention to the humidity. And if you are heating the cage, it will dry out faster, so you will need to make sure the humidity is maintained. Giant African land snails eat nearly constantly in the wild. Their diet includes mostly vegetables and fruits. They're not carnivorous, but they are omnivores, so will eat almost anything. Snails need calcium to keep their shells strong, and barring a source of readily available calcium, they have been known to gnaw through plaster walls, which provides trace amounts of the mineral. These snails get lots of moisture from their food, but may require a bowl of water, designed for reptiles with the stepped edges to keep the snail from siding into it. Be prepared to clean the bowl frequently. Like other snails, giant African land snails are prone to aestivation, which happens when it's in an enclosure or environment that is too dry. When this happens in captivity, the snail forms a membrane over the opening of its shell and seals itself inside, hiding the cute, curious face that makes it a good pet, and requiring you to mist and monitor the heat closely to bring it back out. Snails also are susceptible to infestations of mites and flies. While most such pests are little more than a nuisance and can be eliminated by careful washing, some mites can burrow into the snail's body and make it lethargic and uncomfortable. Giant African land snails need a source of calcium to keep their shells healthy. While a snail can self-repair minor cracks in its shell, some cracks may leave its body exposed, which may lead to dehydration. Most exotic pet veterinarians in the U.S. will not treat giant African land snails because they are illegal. You can't legally purchase this animal in the United States. If you're caught trying to bring one into the country you could be fined by the United States Department of Agriculture. However, if you discover one and bring it to the attention of the USDA, the agency is likely to be grateful for the assistance and you won't be penalized. These snails do not seem to mind being handled, but you must be gentle with them and avoid damaging the shell. Moistening your hands before holding them is recommended by some owners. The shell is most fragile at the base where it is next to the body, so try to avoid picking them up by this part of the shell, and be careful to provide solid support to the body and shell. It's a good idea to wear gloves if you're going to handle a giant African land snail; the animal's slime, or ooze, is believed to contain parasites toxic to humans. Always wash your hands thoroughly after handling a snail. Is It Legal to Own a Pet Giant African Land Snail? Due to the risk of becoming a successful invasive species and being a serious agricultural pest, importation of giant African land snails into the United States is not permitted, and it is illegal to keep them as pets in the U.S.